Kristin Fontichiaro is a clinical assistant professor at the University of Michigan School of Information. She teaches courses in contextual inquiry and user needs assessment; makerspace culture and tools; information literacy; and library and information science. Stop by at any time after 1pm for snacks, beverages, a free bike rental pass (while they last! ), to meet with the Knight Foundation staff and share your awesome-ness with us. Do you have a Knight News Challenge idea brewing? Meet with the Knight Foundation staff at the #IdeaDrop House. Questions? Directions? Free bike passes, you say? Check out libraryideas.org or email hello@electroniclibrarian.org -- your hosts for the IdeaDrop House from March 11-15. Join us on the live stream for a discussion with Jon Voss. Jason will join us to discuss the Measure the Future project and his time as a Berkman Fellow. Presesenters from "Prison Tech Boom: Social Outcomes and Entrepreneurs" will be joining us at #IdeaDrop! This session will be live streamed. This SXSW official presentation details can be viewed here. Derrick Feldmann of Social Activism: How to Ignite a Movement joins us at the Library Idea Drop House. This session will be live streamed. What does it take to transform an idea into a viral movement for social good? Author and researcher Derrick Feldmann has spent the past two years talking with the people behind the biggest social movements of our time. He'll share their stories and some of their secrets and what you can do to make your cause go viral. Effective social movements don't arise by accident. People don't spontaneously come together and effect real change. If you want your movement to succeed, you need a solid strategy and the tools to follow through. You'll learn about the leaders behind movements, the individuals who responded and the approaches that made it work. View this session on the SXSW schedule here. Phil Howard of the session How the Internet of Things Can Set Us Free (Maybe), joins us at the Library Idea Drop House. This event is live streamed. Francesca Birks and Randy Ramusak will explore the emerging challenges of designing for interaction in shared public space. As well as how it is changing security, serendipity, and service delivery in and among connected spaces like parks, libraries, campuses, shopping districts, and neighborhood. Come learn how making our spaces more responsive and intelligent creates entirely new kinds of business and design opportunities. 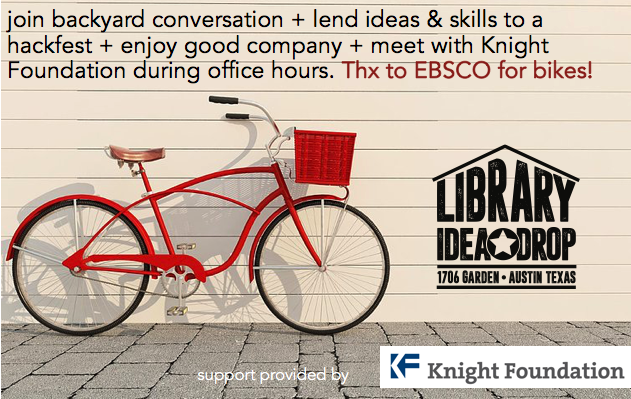 View the invite on Facebook for the Librarian Meetup @ JW Marriott Room 213 110 E 2nd St! Matthew is joining us at the #IdeaDrop house for a conversation about his SXSW talk "Let's Make Open Data Awesome Meet Up"
Check out libraryideas.org to view event video and audio clips.